I told my husband I wanted to make queso dip, and he said, “how are you going to make a cheese dip ‘healthy? '” Well, here’s the answer! Along with all the flavorful spices you simply add peppers, tomatoes and spinach to the mix AND offer veggies on the side for dipping in addition to the chips. So just in time for Super Bowl – give it a go and let me know what you think! :) Oh, and if you are going to serve this on Sunday I would highly recommend trying to keep it warm in something like this. Melt the butter in a medium sauté pan over medium heat. Add the onion and both diced peppers and cook while stirring occasionally until the veggies soften, about 4 to 5 minutes. Add the garlic and other spices to the pan and cook for 1 more minute. Sprinkle in the flour and stir vigorously until the mixture begins to darken but does not burn, about 1 to 2 minutes. Whisk in the milk, continue whisking to break up any lumps, allow it to thicken just slightly, and then turn off the heat. Sprinkle in the cheese, stir with a spoon until it melts completely, and then gently mix in the diced tomato and chopped spinach. Serve warm with veggies and/or chips. Enjoy! If you accidentally thicken the cheese sauce too much you could mix in a little extra milk, but I wouldn't recommend overdoing it since it takes away from the flavors. YUM!! Love all the veggies you added to this dip. This looks delicious! I love the unhealthy velveeta dip, so I’ll have to try this healthier queso dip! Thanks for sharing it! Ooh…cheese dip with peppers and spinach looks even better than regular cheese dip! I might make this next Sunday too. Try adding some fresh cilantro as well. It really gives it a flavor boost. I also like to add black beans to mine. We order something like this at our local Mexican restaurant. I am sure it is made with a processed cheese food. We like the peppers and tomatoes in all the cheesy goodness. I can’t wait to give this a go at our next Mexican night! Thanks Lisa! Looks so good with all the veggies, Lisa! Coincidentally I just posted my vegan queso as well. Who needs that processed cheese? Yuck! I just tried this tonight and it was delicious. To beef it up for dinner I added 2 cans of beans, 1 can of corn and a bell pepper, then doubled the spices and added cilantro. We served it nacho style. Yum! How do I join this group ? Hi Angie. You can subscribe and get access to the meal plans here: https://www.100daysofrealfood.com/our-free-meal-plans/. Looks delicious. What brand tortilla chips do you buy? I second that! I immediatly recognized the Roth name. Haven’t tried the recommended cheese, but Roth’s Butterkase is delicious. I buy it at Brennan’s Market, a fruit and cheese store in Madison. What chips do you buy? Or a recipe, if you make them? Sounds good! How long could you store this in the fridge for? Lisa – I’ve only just discovered your blog. Inspirational! Don’t forget about nutritional yeast as a good cheese / cheese flavor substitute too: although sometimes these kinds of ingredients can be a bit daunting for those new to healthy eating. Thank you so much! I have been looking for a simple something to bring to a Superbowl party so I could have something to munch on! This will do the trick, cannot wait to make it this Sunday! This will be so helpful in keeping me from eating too poorly during the game. Looks great and will definitely try. My cousin’s daughter needs to have food gluten free. Any suggestions on how to thicken it without the flour? I’d love to have a snack that she can enjoy too. Thanks! Hi Terese. You could try arrowroot powder or tapioca starch. So funny you should post this, as I have been wondering about a ‘real’ queso recipe! If you use nutritional yeast that will act as thickener. I would at a little at a time until you get the right consistence. Sounds Delish! I think I’ll make it by the recipe and dump it in a crock pot for a super bowl app. Crock pot warming shouldn’t affect it, correct? I hate velveeta, thanks for this! been wondering about nutritional yeast and if it is safe then told to stay away from yeast extractand autolyzed yeast because it really just another name for msg. I have a braggs nutritional yeast but haven’t used since I was unsure. Anyone know since some are recommending? I think I might try this for my super bowl party this weekend,but I’m going to add some ground meat to it. A friend asked me to make my velveeta dip. I love the idea of adding veggies to this, and using them to dip! This is something I have been working on, adding more veggies to every bite. I bet kids would love this, and picky husbands! Just made this to take to a Super Bowl party later and it is delicious! 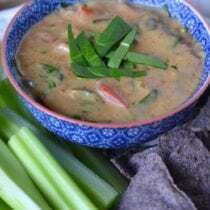 So happy to have a healthy queso dip to make! My store never has poblano peppers, so I picked up a yellow bell pepper. Since I lose the flavor of the poblano, I’m using cilantro instead of spinach and will most likely up the spices. I can’t wait to dig in. I thought this was a great base recipe and awesome for my “velveeta loving” family. Mine did turn out a little grainy so not sure if maybe that was because the cheese I used. It also had a little bit of a flour taste so will make sure I cook it off a little more next time. I made this dip yesterday for my hubby and I to have for the Super Bowl. It was DELICIOUS!! He didn’t like it as much as he loves his Velveeta dip – but I liked it more. He’s willing to make the switch though, as he knows how much healthier this is for us and in his words “it’s not bad at all”. :) He’s a tough cookie, very picky, so I’m taking this as a success! It was soo yummy. I can’t wait to eat up the leftovers. So thankful for a recipe that didn’t use Velveeta! This was easy and super tasty. What is that the food with the color black/purple dark ? We eat with that ? how if that soup we eat with the bread or pasta ? Hi there. I think you are talking about the blue corn tortillas? Do you think you can reheat this in the microwave, or possibly keep warm in a crockpot? I want to take this to a work Cinco de Mayo party but those would be my only “appliances” available to reheat. Hi there. The crock pot work great for keeping and serving this dip hot. My daughter has celiac. Has anyone tried this with a gluten free flour? Hi Missy. We’ve not but I do think it will work. SERIOUSLY – my 13 year old son just told me he can’t stop eating this. This is a WIN! Took it to work today for a World Series (yes our team is in) potluck and luckily I doubled it. 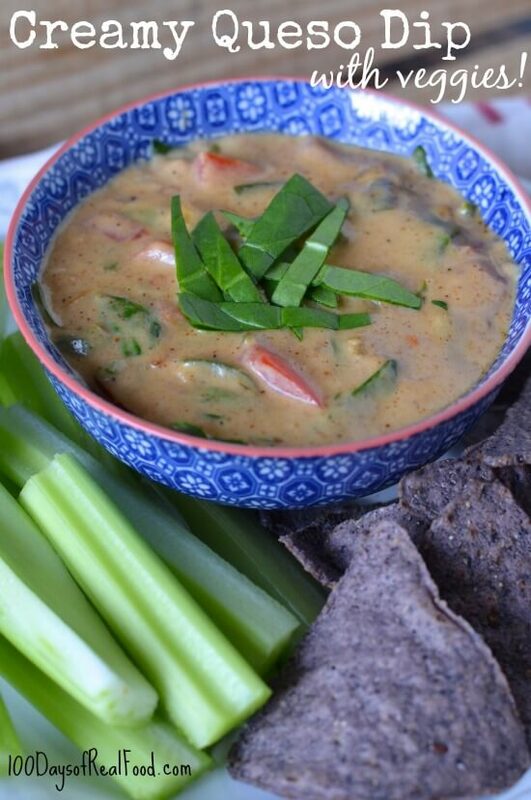 Love this healthy queso dip! I just made it for my friends and we absolutely loved it. So cheesy!!! Hi there. It can get a little grainy after being frozen but it still tastes good. This looks fantastic! I love queso dip, but most of the ones I’ve had are just cheese and some spices. I like the addition of the veggies in this one. Can’t wait to try it! I thought this was pretty good, but both my husband and I felt that there was something lacking. It needed more oomph, but we weren’t quite sure what. I tried adding more salt and some paprika and that seemed to help a bit, but still not right. Anyone have any suggestions? Would this be good with cheddar?? Hi. We’ve not tried it with a cheddar but it should work, too. Have made this half a dozen times and am loving it again on this snowy day! Thanks for being an incredible cook and sharing it with the rest of us! The recipe calls for an “1/8 teaspoon red bell pepper” that seems like a very small amount of red bell pepper. Is this supposed to be 1/8 of cayenne or red pepper flakes? Just wanted to check.